NEC 690.8(A)(1) – 1.25 times the STC Isc rating is used for design. This 1.25x factor accounts for instances where the temperature and insolation is better than STC conditions, causing the system to output higher short circuit current than its STC rating for more than 3 hours. NEC 690.8(B)(1) – 1.25 times the maximum current calculated in 690.8(A)(1). NEC requires engineers to load breakers and switches to only 80% of their rating. However, continuous duty is listed as an exemption to this second 1.25 factor. Continuous duty (AKA fully rated) devices can be loaded to 100% of their rating. A majority of the output disconnect switches in combiner boxes are rated for continuous duty. Therefore, the second 1.25x factor doesn’t apply, only the first 1.25 factor applies. 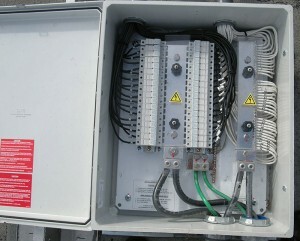 Therefore you can base the combiner box size on 1.25x the maximum current, not 1.56x. This usually allows you to use a smaller disconnect switch, saving hundreds of dollars on each combiner box. The same thing goes for unfused DC disconnect switches rated for continuous duty, such as those by Eaton. However, the fuse assemblies are not rated for continuous duty, so you must use the 1.56 factor on Eaton’s fused disconnect switches. Be careful, even if you have a continuous duty combiner box sized at 1.25x, the wiring and upstream OCPD must still be sized for 1.56x. So it could be perfectly acceptable to have a 200A disconnect combiner box being protected by a 250A upstream fuse!